In biology, an artery is any of the muscular blood vessels that carry blood away from the heart to the cells, tissues, and organs of the body. This is in contrast to the veins, which are blood vessels that carry blood toward the heart. All arteries, with the exception of the pulmonary and umbilical arteries, carry oxygenated blood to the tissues. The pulmonary artery carries deoxygenated blood from the heart to the lungs and the umbilical artery carries deoxygenated blood from the fetus to the placenta through the umbilical cord. In developed countries, the two leading causes of death, myocardial infarction (heart attack) and stroke, each may directly result from an arterial system that has been slowly and progressively compromised by years of deterioration. Atherosclerosis, commonly known as hardening of the arteries, is a disease affecting arterial blood vessels that is due in large part to the deposition of particular lipoproteins (biochemical complexes of proteins and lipids) that circulate in the blood and carry cholesterol and triglycerides. The arteries and veins function harmoniously as complementary components in the circulatory system's rhythmic flow cycle orchestrated by the beating heart. As an integral part of this cycle, the arteries participate in delivering oxygen and nutrients to all cells, removing carbon dioxide and waste products, maintaining optimum pH, and circulating hormones, immune cells, lipoproteins, enzymes, and diverse other factors essential to life. As a vital system, the term "artery" also is used in a broader, cultural sense to refer to rivers, railroad, and highways as arteries of transportation and commerce. The arterial system is the higher-pressure portion of the circulatory system. Arterial pressure varies between the peak pressure during heart contraction, called the systolic pressure, and the minimum, or diastolic pressure when the heart rests between contractions. This pressure variation within the artery produces the pulse that is observable in any artery, and reflects heart activity. Arteries include both large and minute blood vessels that transport blood away from the heart. In humans, the largest artery is the aorta. It subdivides into smaller arteries, which give rise to smaller, threadlike blood vessels called arterioles, which further divide into the smallest blood vessels, the minute capillaries, which connect arterioles and venules (minute veins). Among the ancient Greeks, the arteries were considered to be "air holders" that were responsible for the transport of air to the tissues and were connected to the trachea. This was as a result of the arteries of the dead being found to be empty. In medieval times, it was recognized that arteries carried a fluid, called "spiritual blood" or "vital spirits," considered to be different from the contents of the veins. This theory went back to Galen. In the late medieval period, the trachea and ligaments were also called "arteries" (Shakespeare 1994). William Harvey described and popularized the modern concept of the circulatory system and the roles of arteries and veins in the seventeenth century. Alexis Carrel at the beginning of twentieth century first described the technique for vascular suturing and anastomosis and successfully performed many organ transplantations in animals requiring the joining of artery to artery as well as vein to vein. He opened the way to modern vascular surgery at a time when vascular surgery had been limited to closing vessels by permanent ligation. The term artery is derived from the Greek artēriā, a term applied to any of the vessels that emanated from the chest cavity, including arteries, veins, and the bronchial tubes, which anatomists believed carried air (Harper 2001; HMC 2004). As it was learned that the windpipe and bronchial tubes carried air, the phrase artēriā trakheia, or "rough artery," was used to refer to the windpipe, with the term trakheia becoming the current term for the windpipe, trachea (HMC 2004). The anatomy of arteries can be separated into gross anatomy, at the macroscopic level, and microscopic anatomy, which must be studied with the aid of a microscope. The arterial system of the human body is divided into systemic arteries, carrying blood from the heart to the whole body, and pulmonary arteries, carrying blood from the heart to the lungs. Systemic arteries are the arteries of the systemic circulation, which is the portion of the cardiovascular system that carries oxygenated blood away from the heart, to the body, and returns deoxygenated blood back to the heart. Pulmonary arteries are the arteries of the pulmonary circulation, which is the portion of the cardiovascular system that carries deoxygenated blood away from the heart, to the lungs, and returns oxygenated blood back to the heart. The outermost layer of an atery is known as the tunica externa (formerly known as "tunica adventitia") and is composed of connective tissue. Inside this layer is the tunica media, or media, which is made up of smooth muscle cells and elastic tissue. The innermost layer, which is in direct contact with the flow of blood is the tunica intima, commonly called the intima. This layer is made up of mainly endothelial cells. 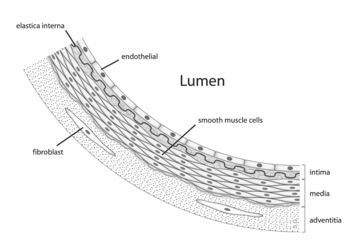 The hollow internal cavity in which the blood flows is called the lumen. The pulmonary arteries carry deoxygenated blood that has just returned from the body to the lungs, where carbon dioxide is exchanged for oxygen. Systemic arteries can be subdivided into two types: muscular and elastic. This division is according to the relative compositions of elastic and muscle tissue in their tunica media as well as their size and the makeup of the internal and external elastic lamina. The larger arteries (over one centimeter in diameter) are generally elastic and the smaller ones (0.1 to ten millimeters) tend to be muscular. Systemic arteries deliver blood to the arterioles, and then to the capillaries, where nutrients and gases are exchanged. The aorta is the root systemic artery. It receives blood directly from the left ventricle of the heart via the aortic valve. As the aorta branches, and these arteries branch in turn, they become successively smaller in diameter, down to the arterioles. 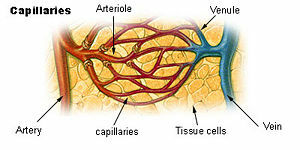 The arterioles supply capillaries which in turn empty into venules. The aorta is a hard artery, and as such is quite distensible. 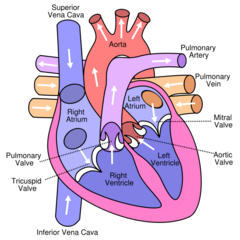 When the left ventricle contracts to force blood into the aorta, the aorta expands. This stretching gives the potential energy that will help maintain blood pressure during diastole, as during this time the aorta contracts passively. Arterioles, the smallest of the true arteries, help regulate blood pressure by the variable contraction of the smooth muscle of their walls, and deliver blood to the capillaries. Arterioles have the greatest collective influence on both local blood flow and on overall blood pressure. They are the primary "adjustable nozzles" in the blood system, across which the greatest pressure drop occurs. The combination of heart output (cardiac output) and systemic vascular resistance, which refers to the collective resistance of all of the body's arterioles, are the principal determinants of arterial blood pressure at any given moment. Capillaries are the smallest of a body's blood vessels, measuring five to ten μm (.005 to .01 mm) in diameter, which connect arterioles and venules. The capillaries are the site of all of the important exchanges occurring in the circulatory system. These include interchange of water, oxygen, carbon dioxide, and many other nutrient and waste chemical substances between blood and surrounding tissues. Being only a single cell thick, the capillary walls permit fast and easy diffusion of gases, sugars, and other nutrients to surrounding tissues. To withstand and adapt to the pressures within, arteries are surrounded by varying thicknesses of smooth muscle which have extensive elastic and inelastic connective tissues. The pulse pressure, the difference between the systolic and diastolic pressures, is determined primarily by the amount of blood ejected by each heart beat, the stroke volume, and the volume and elasticity of the major arteries. Over time, elevated arterial blood sugar, lipoprotein, cholesterol, pressure, smoking, among other factors, are all involved in damaging both the endothelium and walls of the arteries. Harper, D. 2001. Artery. In Online Etymology Dictionary. Retrieved May 03, 2008. Houghton Mifflin Company (HMC). Artery. In The American Heritage College Dictionary, 4th edition. Boston: Houghton Mifflin. Retrieved May 3, 2008. Shakespeare, W., and S. Lindgren Wofford. 1994. Hamlet Complete, Authoritative Text with Biographical and Historical Contexts, Critical History, and Essays from Five Contemporary Critical Perspectives. Boston: Bedford Books of St. Martins Press. ISBN 0312089864. This page was last modified on 20 August 2008, at 13:20.